I’ve long been aware of this particular feature within Application Manager, but had yet to see a real-world application of it. However, recently I did some work for a client with a very large infrastructure and a lot of delegated administrative access to servers and clients. It turns out that some server support groups had been adjusting the time on their managed servers to bring it into line with their local times, conveniently forgetting that the servers were hosted in an overseas datacenter. Now, allowing servers to fall out of synchronization time-wise is pretty bad. Firstly, your logs are now going to be completely inaccurate. There are also the effects this can have on hosted applications – think a database application that relies heavily on time accuracy, and the resultant screw-ups that can occur as a result of this being skewed. If the servers are DCs that have been erroneously adjusted, then you’re going to have a world of problems with replication just to start with. Some applications even flat-out refuse to start if an incorrect date and time is detected – it can cause that many issues. Of course, there is probably something you could do with a server admin group that changed the time on their managed systems without proper due diligence – I think shooting them, or at the very least handing them their notice, would be high up everyone’s lists. But in this case, once the people involved had been harshly warned about their conduct, management wanted to put into place some way to prevent a user with administrative access from actually being able to change the system time. How could we achieve this? 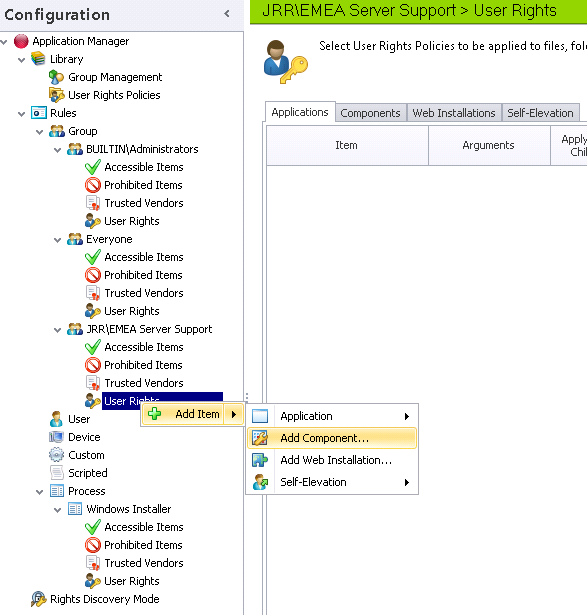 Well – enter AppSense Application Manager. First we need to open the Application Manager Console and create a new Group Rule, as we only want to apply this rule to a particular group of (incompetent) Administrators. If we applied it across-the-board to all local Administrators, nobody would be able to change the system time! So we will use a specific Active Directory group to apply this configuration. We choose the group “EMEA Server Support”, and this group is designated as “Restricted”, as we are going to restrict their execution options slightly. Now, we have a couple of options as to how we could restrict the user from being able to change the time. 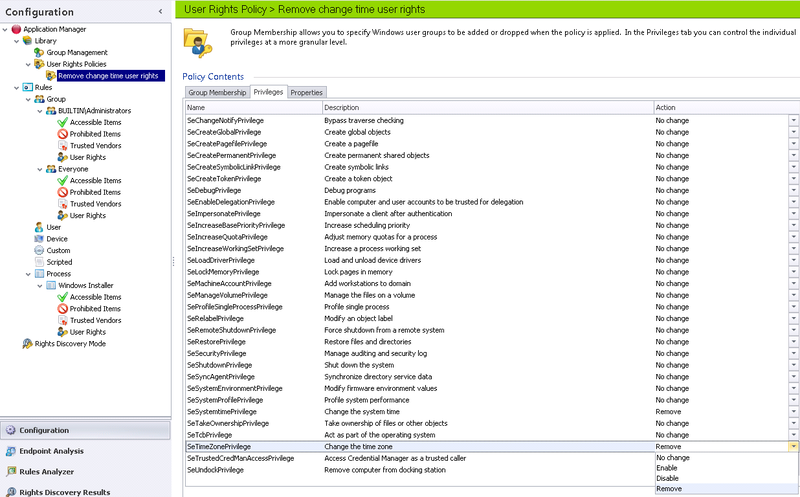 We could use remove the user right “change the system time” from this user by setting up a custom User Rights Policy, or we could use the “Builtin Restrict” pre-built policy to simply reduce the user’s rights when they launch the required Control Panel applet to change the time. It is simpler to use the latter option, so that’s what we will opt for in the first part of this example – although we will come back to the other option later. …and as you can see the answer is a resounding no. This is because the “de-elevation” of privilege is only occurring when the Date and Time applet is run. 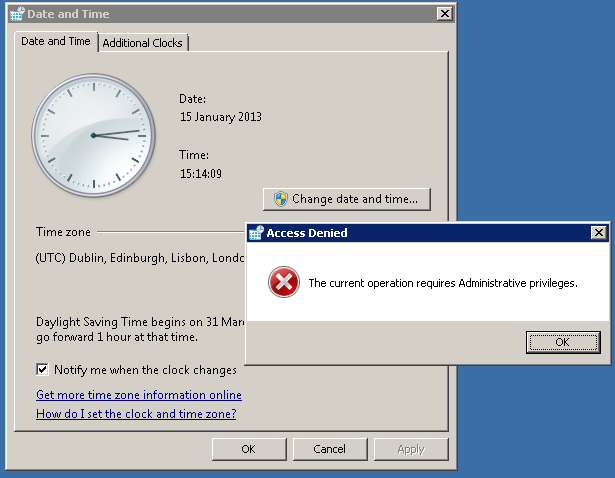 So how can we stop the admin group from being able to change the date or time from the command prompt as well? We could de-elevate on the launch of the command prompt – but that would kill a whole host of functionality they may need. What we need to do is actually remove the specific rights that actually relate to this administrative function – and as I alluded to earlier, we can use a custom User Rights Policy to alter the user right for Change the system time. Will this work? Let’s go back to our configuration and have a try. Now, we need to go back to our Group Rule and add the required files to the Applications tab under User Rights. I’ve added the cmd.exe program from both the system32 and syswow64 folders because I am working on an x64 platform and you don’t know when people might launch this from unexpected areas. I’ve also added the applications as both File and Signature items to show you both the options, but either one should suffice. Success! Now our target group have administrative privileges but can’t change the system time and date to create problems. Bear in mind that if you remove these privileges in this fashion, they can be a little annoying to reinstate. 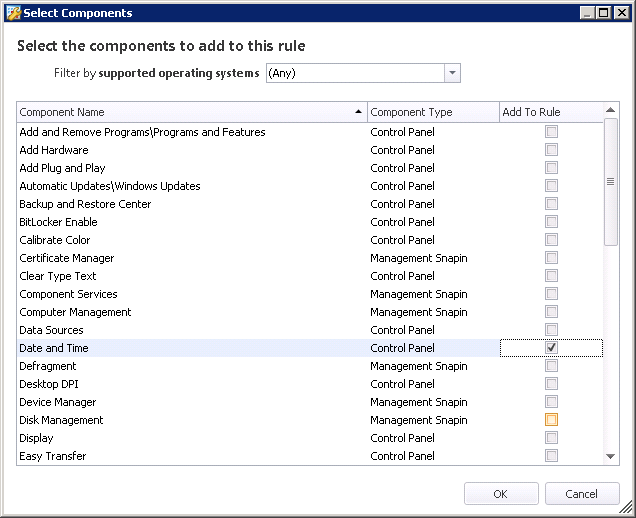 You will actually need to change the configuration and then restart the Application Manager service to get the changes to revert – simply deploying an updated configuration doesn’t seem to make it go away. And before I forget, Happy New Year everyone, rather belatedly! Hey James, how would you perform this function with an executable? For example, we are trying to ensure Internet Explorer or any other browser is run with admin privileges.